Beyonce randomly released a new self-titled album on Thursday on iTunes without promoting it or mentioning the release date prior. There are also 17, count ’em, SEVENTEEN new music videos and everyone’s talking about how only she and a handful of other mega famous artists could pull off such ballsy move, but what they’re failing to mention is that the CD is super raunchy. Lady Gaga has been quite the busy bee this week, unveiling her ARTPOP album art in Times Square as well as the entire 15-song tracklist and a new song from Robert Rodriguez’s Machete Kills soundtrack, which hits theaters tomorrow and features Gaga in her acting debut as the mysterious temptress La Chameleón. The titles are a sort of personalized Scrabble board of obvious Gaga-esque obsessions (Versace, manicures, fashion) and super duper artsy stuff like drugs and wet dreams. Really Gaga, Mary Jane Holland? …Most obvious weed reference EVER. 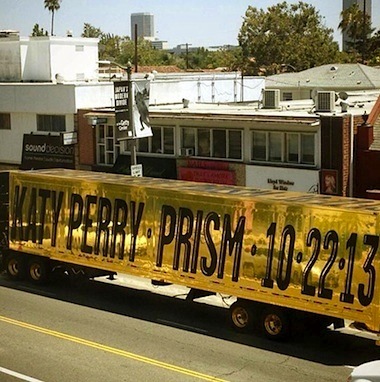 Katy Perry‘s PR team revealed the name and release date of her new album via gold semi truck. She says that “Los Angeles is just the first stop on the map,” so keep your eyes peeled and your finger on your iPhone camera app if you want to possibly end up being retweeted by Perry herself. In case you’re partially blind or tweaking and couldn’t tell from the headline and picture Prism, will be available on October 22. 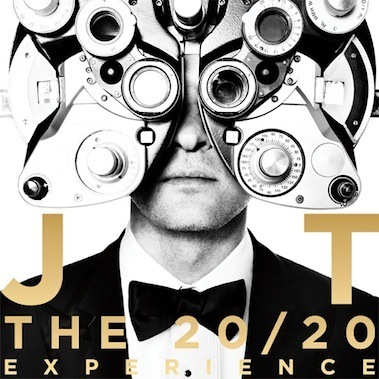 On the album cover for The 20/20 Experience, future-obsessed Justin Timberlake peers through one of those freaky optometrist torture devices. Like Jessica Biel, it’s shiny, stiff and has a lot of knobs on it, which makes it just random enough to seem relevant even though it’s roughly 92 years old. Question: If unfamous, untalented Justin Timerberlake was walking down the street, would you still glance his way? If the answer is “yes,” I figure it’s because of those mesmerizing blue eyes, which are purposefully hidden on this cover. That’s just bad marketing. Play to the audience any less and it’s Joey Fatone. Britney Spears‘ recording schedule has always been a bit erratic. She churned out an album for each of the first three years of her career, taking a breather after Britney (2001) and then In The Zone (2003) to get married, have kids, shave the old noggin’ and keep a watchful eye on Fanta and beef jerky sales at the gas station. She returned for Blackout (2007, infamous “Gimme More” dance at the VMAs) and Circus (2008), then took a nearly three-year break before releasing Femme Fatale. Ladies and Harry Winston blunt-rolling germs, save your silver dollars. A limited edition copy of Rihanna‘s new album is going to set you back. While the standard and deluxe versions of Unapologetic, out November 16, will cost a regular $13.99 and $17.26, the “Diamonds Executive Platinum Box,” will cost $250. It comes with a t-shirt, lithographs, vinyl with remixes and the “Diamonds” single, a 40-page booklet of lyrics and other scribblings, 2GB flash drive, a ViewMaster stocked with previously unreleased photos, stickers, and a handwritten note from Ms. BarbadoClownTastic herself. I have to give major props to bold new Swedish pop artist Sophia “Soso” Somajo for releasing her debut album for free on the torrent website The Pirate Bay. The official cover art and tracklisting for Garbage‘s first CD since 2005 has been revealed for my fanatic eyes to feast upon. 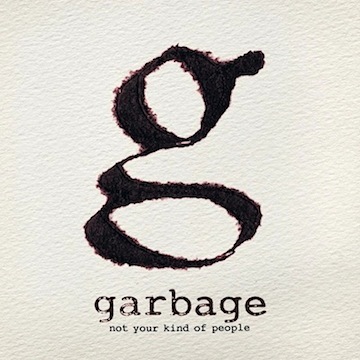 Not Your Kind Of People will be released on May 15th in standard edition, with eleven tracks. 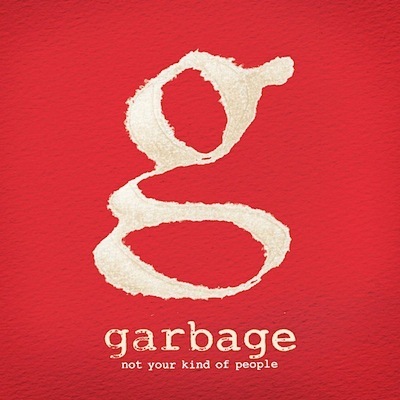 The deluxe edition has simple red cover art with the band’s signature “G” instead of white, plus four bonus songs. Shirley, Butch and the gang are currently filming a video for it. 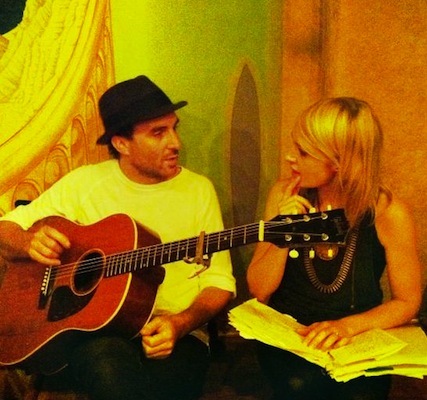 Besides revealing the title, the simplistic but potentially epic “Synthetica,” which seems like it could have been their last album’s title, frontlady Emily Haines has written more about the CD’s content on the band’s website. They’ve included a countdown to its release date on June 11 (it is their fifth album and first since 2009) plus a vague but somehow detailed description on the best kind of depravities. New Killers Album In 2012, First In Four Years! 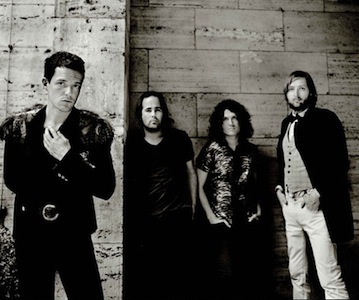 The first Killers album since 2008’s Day & Age is scheduled for 2012, Brandon Flowers has confirmed it. He says to expect a mix of the old and some new as well. This is wonderful news for fans no matter what the album sounds like. A disappointing third Killers record not to mention the horribly crappy Brandon Flowers solo effort from 2010 had everyone wondering if the band was over. A New Garbage Album Is Expected In March, 2012! New music from Garbage is finally becoming a realization, nearly seven years after 2005’s Bleed Like Me, not to mention rumors of a full on break-up then a Shirley Manson solo contribution and more whispers of new material as far back as 2007. B.o.B’s new song “Strange Clouds” featuring Lil’ Wayne surpassed Maroon 5’s “Moves Like Jagger,” which spent weeks at the top spot, and Adele’s “Someone Like You” whose video was just released, on the iTunes top songs chart yesterday. 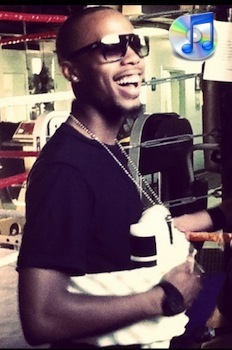 B.o.B aka Bobby Ray Simmons, 22, is of course famous for his songs “Nothin’ On You” featuring Bruno Mars and “Airplanes” featuring Haley Williams, two of the absolute biggest hits of 2010.